I had a good turnout for what some consider to be the most dreaded hike of a 48-4k series. Owls Head is a long walk in the woods. 18.6 miles (round trip) to the New Official Summit. Our group of 6 was finally assembled at the Lincoln Woods parking area and we were on the trail around 8:30 AM . From the parking lot, the Lincoln Woods Trail crosses a suspension footbridge over the East Branch. I recommend that one read the history of the railroad posted here. You will be hiking on old railroad ties (spikes included for the next several miles). After the bridge turn right on the old railroad grade which crosses several small brooks and one on a wood bridge before crossing an unnamed brook. The second time this brook is close to the trail above here, the Osseo Trail to Mount Flume leaves left at 1.4 miles. 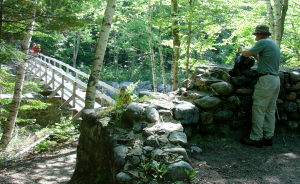 The railroad grade crosses Birch Island Brook on a wood bridge, and at 2.6 miles the Black Pond Trail leaves left. Here we discussed a possible bushwhack which would have avoided two daunting stream crossings. We decided to stick to the original plan. The railroad grade soon passes through the now-closed Franconia Brook Campsite, and the path to Franconia Falls leaves L at 2.8 miles, just before the long bridge over Franconia Brook. 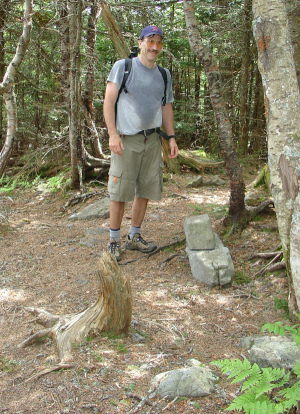 The trail climbs a steep bank and enters the Pemigewasset Wilderness where the named Lincoln Woods Trail ends at the junction with the Franconia Brook Trail at 2.9 miles. It does continue, however, under the name of the Wilderness Trail. The White Mountain Guide still uses this name for the entire trail. We had a couple of stream crossings that wood be pretty difficult in high water but were doable today. Some opted to do them boots off, myself included, others did adventuresome rock hopping. I enjoyed the opportunity to cool off the feet, wash off the mud, and do a sock change. When we finally got to the dreaded Owls Head Slide Trail. There was evidence of the ongoing war with the Park Ranger who continually, as lore has it, knocks down signs, cairns, etc. 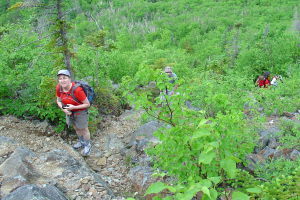 to maintain the wilderness status of Owls Head. The turn which is habitually missed, as a result of this, was marked by a bunch of rocks carefully placed along a blown down tree and a lost(?) sleeping bag. Here we started climbing for the first time up this slide. This is unwelcome as you have already hiked for 7 miles. The weather was nice, as were the views. There are some real nice views further up the Lincoln Brook Valley, as well as of the backside of Franconia Ridge. Hear we decided to stop for lunch and enjoy the only viewing spot of the trip. This slide is extremely loose small stone that requires sure stepping along the way. It is time consuming and exhausting to say the least. There a 2 fools summits. This is the wilderness, and you must rely on another's interpretation of the real summit. The first is a small tree surrounded by a cairn. The next is the old summit evidenced by the nail holes on a tree where the old Owls head sign was posted. The new official summit is an approximate .3 mile bushwhack to where a new Owls sign is posted (For Now). We left the top just after 2:00 hastened by the sounds of thunder. I did not want to be on that slide during a thunder storm! Luckily we had only a mere sprinkle during the day and clear sunny skies for most of the day. We hit the parking area at 7:00, pretty tired but happy. A quick change to dry clothes, then off to a not so good pizza joint in Lincoln. Charlene balancing on the very unstable Owl's Head Slide.